Flying Lessons: When It's Fun to Fly, Call Me Maybe. When It's Fun to Fly, Call Me Maybe. I am not blessed with children who love to fly. Drive? Yes. Fly? No. Son Joseph, 17, does have a tendency to introspection which explains why, 24 hours after we arrived in Italy after a trans-Atlantic flight on a United Boeing 767, I heard him repeat back to me something that the flight attendant told him as he squeezed the armrests and fought with his fear that our plane would crash on takeoff and kill us all. "I blame the movies," the perceptive flight attendant said as he observed Joe's obvious terror. We were racing down the runway and into a sky mottled with clouds while through the clear bits shone brilliant pink streaks of evening sunlight. What is not to love? "Every time I see an airplane in a movie, its crashing," Joe told me as we walked through the streets of Bergamo Alta, the part of this northern Italian city created centuries before we all started flying around the world. "That's why I worry when I get in an airplane." But the flight attendant's words rang true to Joseph and he told me when he thought about it that way, he wasn't as scared. We should also not underestimate the power of a mind-boggling selection of in-flight movies that kept my teenaged son highly distracted, good! And awake, not so much. So one can't discount the benefits of Hollywood magic either. I've been thinking about all this since writing a few articles on the use of airliners in movies, one of which has already appeared in the International Herald Tribune.The businessmen behind Air Hollywood, Stargate Studios and Scroggins Aviation don't select the subject matter, they just help movie makers put on their imaginations on flim. 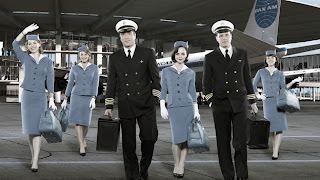 But the material does seem to skew to death and distruction or in the case of the TV program, Pan Am, the glamor-filled yesteryears of flying. Pan Am the TV show. Photo courtesy Sony. That is until recently when a clever catchy song Call me Maybe by the 26-year old Canadian singer Carly Rae Jepsen got the attention of the American Olympic Swim Team. In the astonishingly adorable lip-sync version swimmers are dancing in the aisle of an airliner and flying seems fun again. I am lovin' this video but watching the flying swimmers just made me ready for more so how delighted was I when I saw the United States Marines airplane mechanics got into the act too? Okay, Joe and I are off for gelato, but in the air or on the ground we leave these swimsuit-snapping, tool-tapping, summer special sound tracks for you to enjoy. I can honestly say that one of the safest spots that I can imagine to be on Earth at any given time is in the cabin of a B-747-400 cruising at 37,000 feet. "don't confuse me with facts." the VP of my hospital used to say. Humans are ( probably ) the only animal who makes up a story to fit the facts. Our body's were not designed to move with some of the forces we experience flying ( especially acceleration). So we "feel " funny and make up a story. Some of us like it and some don't. So it's a romantic novel or a disaster movie. In my experience, when we Learn about these feelings and master them the story changes.